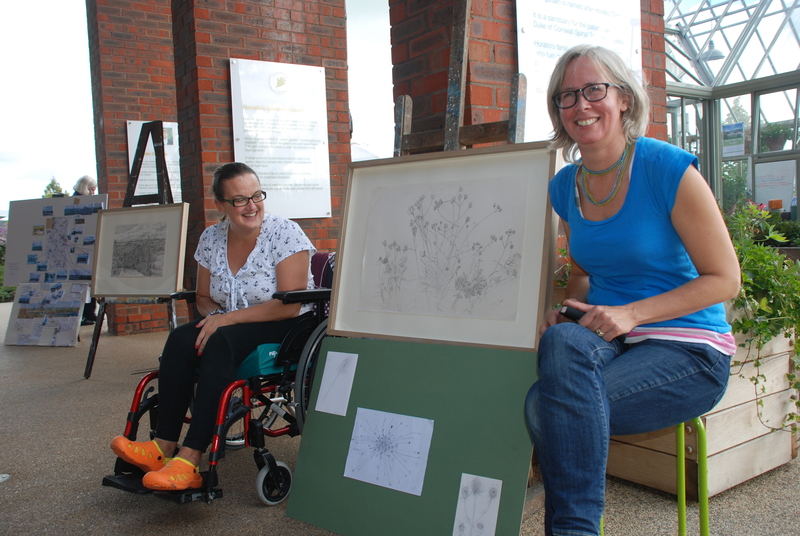 This Sunday saw the culmination of a collaborative art and archaeology project that Miranda and I have undertaken at Horatio’s Garden and the Salisbury Hospital Spinal Unit (http://www.horatiosgarden.org.uk). 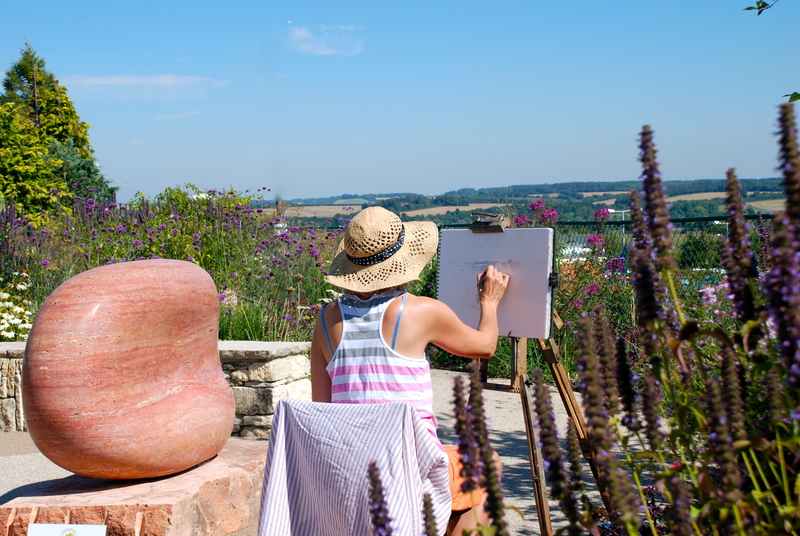 Our hope when we embarked on this venture was that we could bring the wider world, in the form of the landscape view from Horatio’s Garden, to the patients of the Salisbury Hospital Spinal Unit. As far as we are aware, this is the first time that an archaeologist, an artist, a garden and a hospital have come together, so this was very much an exploratory project. We had no idea if this would work, but we are very proud to say that it did. 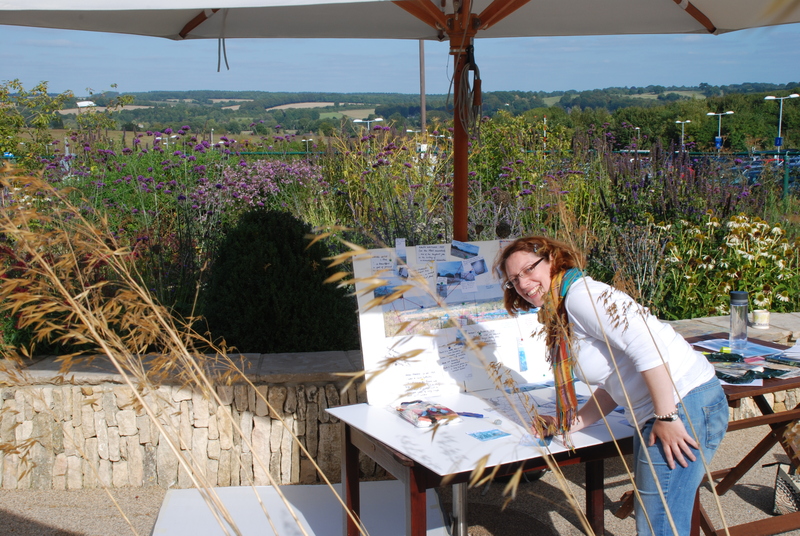 Me working on my view board in the garden (photo: Olivia Chapple). On Wednesdays and Fridays throughout September, Miranda and I installed ourselves in the garden, where Miranda worked on a landscape drawing and I put together a view board. My view board brought together information and photographs about the archaeology of the view, in particular the parishes of Clarendon and Alderbury (which form part of one of my case study areas), and the thoughts and observations of the patients, staff, visitors and volunteers at Horatio’s Garden. The conversations that gave rise to the latter turned out to be very wide-ranging, fascinating and immensely valuable. In the course of these conversations, people’s talents and broad interests also came to light, so come Sunday, we were able to put together a varied exhibition and entertaining set of talks that included works from photographers, one of whom was an aerial photographer, artists, a musician and people running a conservation project in Somerset. The icing to this cake was that 58 patients, staff, volunteers and visitors attended – including some staff who came in on their day off! A view of Pugin’s house (St Marie’s Grange) in Alderbury from one of the patient’s rooms. Janina and Miranda with Janina’s artwork at Sunday’s event (photo: Olivia Chapple). The positive ripples created by our time in the garden and by Sunday’s event have already led to new friendships – two people have even been overheard having an in-depth conversation about Roman coins. We feel that this was all achieved by a ‘light touch’ approach, and, most importantly, by a willingness of all involved to talk and to be generous with their time, talents and knowledge. We very much hope this will be the beginning of a long collaboration with Horatio’s Garden. My very sincere thanks go to all those involved in Horatio’s Garden for sharing their spirit and for their generosity. Playlist of EngLaId talks, etc. English Landscape and Identities Blog at WordPress.com.